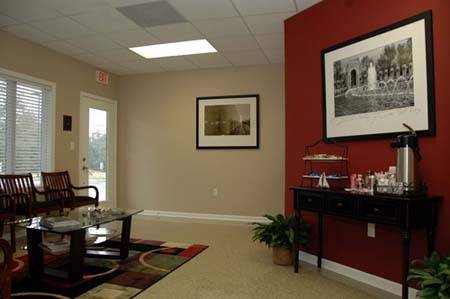 Shortly after graduating from the University of Arkansas for Medical Sciences I had a vision of creating a comfortable, upscale and friendly office in which to provide premium hearing healthcare services to the people of Arkansas. This facility would include a state-of-the art hearing aid fitting room outfitted with a surround sound system capable of recreating virtually any sound environment. Fresh brewed gourmet coffee, soft drinks, and snacks would always be available. After serving the people of Pine Bluff and surrounding areas for nearly ten years my dream became reality in June of 2007 when Pamplin Audiology and Hearing Center opened in beautiful new offices located at 7500 Dollarway Road in White Hall. Please drop in for a tour and a really good "cup of joe" and sign one of our war memorial posters. In honor of all of our veterans I have framed some large memorial posters with oversized mats for signing. We have images of the World War II Memorial as well as the Vietnam Memorial, so if you are a veteran of either of these wars, or have a loved one who was, please come by and sign. It's a great way to honor our vets, and really fun to see the signatures already there.